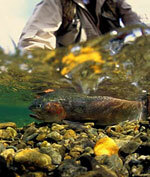 With the approach of summer and fall, trout are increasingly challenged by lower water levels and higher temperatures. Even in optimal conditions, poor fish handling can mean your catch won’t survive to reproduce or provide other anglers the same thrill. This week Phil Monahan asks Dave Kumlein, Frank Smethurst and other expert anglers about their personal tips for ensuring fish survival.